Heard those lyrics over the car radio last week. I did not know that the Emerald City was close enough to hell that you could actually see it from there, but that whole geography sounds a lot like Vancouver. As everybody knows, the Emerald City is the fictional capital city in L.
The other evening I had to go to a meeting in a condo tower’s boardroom. 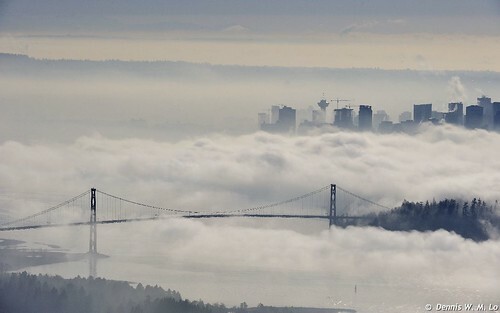 This is the odd fog inversion Vancouver has been under for most of January. Anyone living close to the harbour is now seriously over the supposed charm of the foghorns, which blew approximately every forty seconds all night long, every night for weeks. Above are views of a few downtown buildings rising above the fog, taken from up in the mountains.